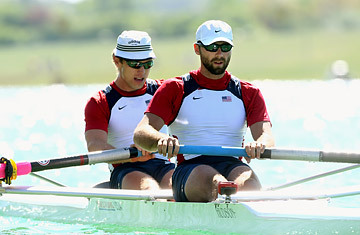 Like quite a few Olympians, Volpenhein, whose strong stroke helped push America's eight-man rowing crew to a gold medal in Athens, went back to school after the Games. But have any another athletes slaved over a stove in class? Volpenhein attended a Seattle culinary school for 2006 and half of '07, and even interned at a high-end French restaurant. He loves charcuterie, the cuisine devoted to meats like bacon, sausage and pâtés, and plans to become a chef when his rowing career ends. Volpenhein carries his rowing skills into the kitchen. "In rowing, you're always striving for that perfect stroke, that repetition, each one being as good as the last," he says. "Same thing with cooking. You can't say, 'Oh, I don't feel well, so I'm going to put out a crappy plate.'"